On October 12, 2015, a provincial plaque was unveiled in Honfleur, France to commemorate the 400th anniversary of French presence in Ontario (see media release). 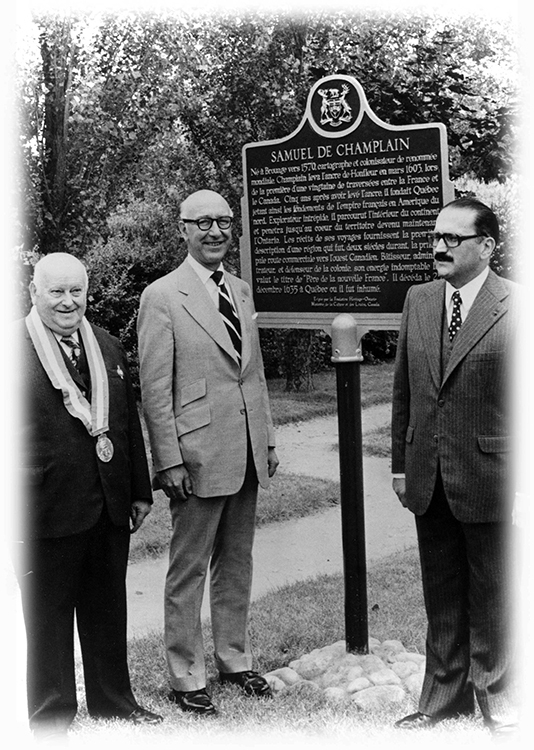 This provincial plaque shares the history of Samuel de Champlain’s first trip in 1615 to what is now Ontario. 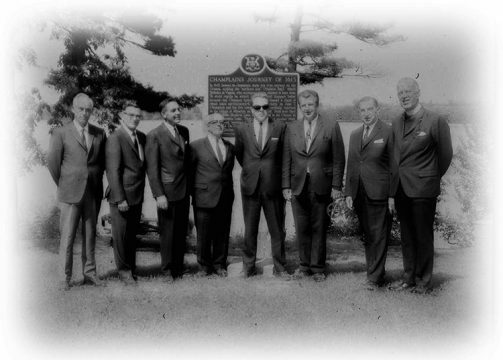 It is entitled Champlain in Ontario, 1615. 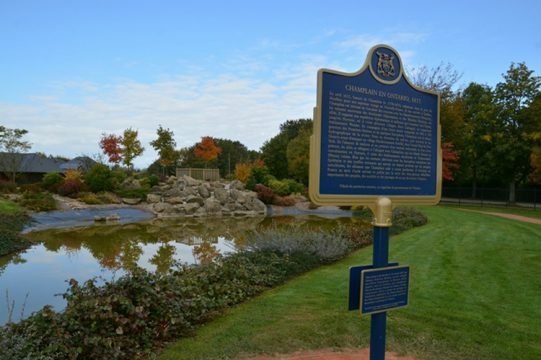 The provincial plaque was unveiled in Champlain Park – Champlain’s point of departure in 1615 – by the Honourable Madeleine Meilleur, Ontario Minister Responsible for Francophone Affairs, and by Michel Lamarre, Mayor of Honfleur. 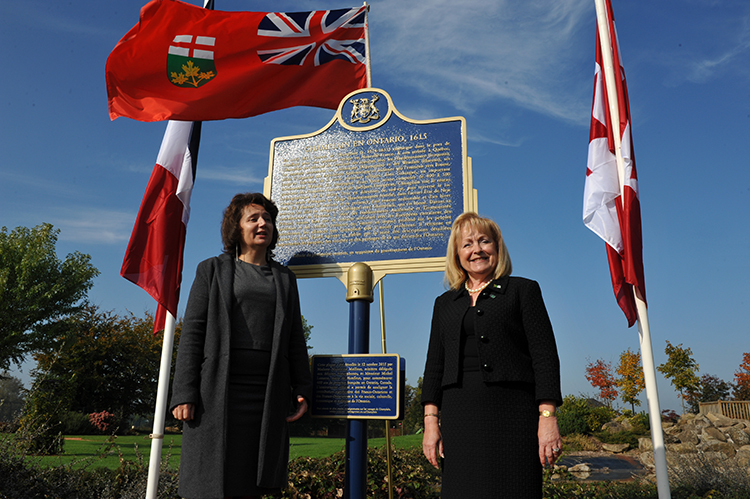 The Honourable Madeleine Meilleur and the Deputy Mayor of Honfleur,France unveiled a commemorative plaque that Ontario presented to the Town of Honfleur in recognition of the ties that link Ontario to France over 400 years. On June 16, 1968, a provincial plaque was unveiled in the village of Cobden (near Renfrew, Ontario) to commemorate the journey made by Samuel de Champlain up the Ottawa River in 1613. 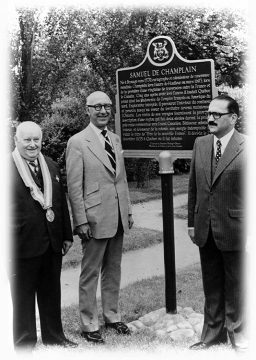 In 1965, a provincial plaque was unveiled in Samuel de Champlain’s hometown of Brouage, France to commemorate the 350th anniversary of his visit to Ontario. 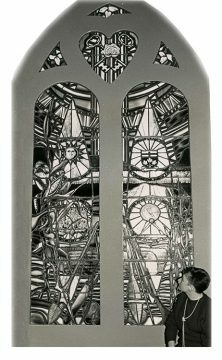 As part of the 350th anniversary commemorations, this stained-glass window was installed in Samuel de Champlain’s hometown church in Brouage, France.